Camera change time. The 720nm e-PL1 has gone to a good home (the camera that taught me most of what I know so far on IR) and is replaced by a svelte e-PM2, which will be immediately off for a 660nm modification. This entry was posted in Info and tagged e-PM2, infrared, olympus on October 31, 2014 by nigelbeighton. This entry was posted in Howto and tagged hotspot, hotspot lenses, howto, infrared, lenses, photography on October 31, 2014 by nigelbeighton. Feeding the ducks this lunchtime in Twickenham. Full-spectrum Panasonic G2, UG1 filter (UV+IR mix). 3 composite HDR. Contrast and colour tweaked in Aperture. This entry was posted in Images and tagged full spectrum, infrared, twickenham, UG1, uv on October 31, 2014 by nigelbeighton. A good hotspot example from the http://www.astrosurf.com/ site. 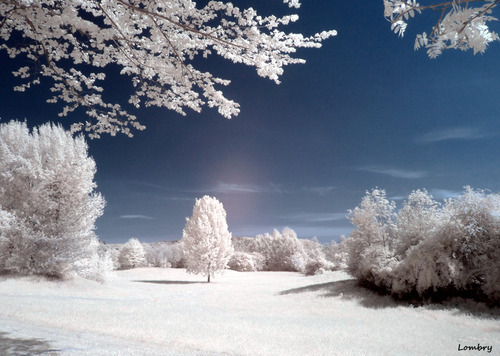 This entry was posted in Howto and tagged infrared, lens hotspot, photography on October 30, 2014 by nigelbeighton. A very helpful list of lenses that suffer, and don’t suffer, hotspot issues. Also a useful post on the www.mu-43.com site, for those like me using M43 lenses with their IR (original post link). I can testify to the validity of the Oly 14-42mm II R, 9-18mm and the Panasonic 14-42. I have not seen it on my Oly 17mm f2.8, but I suspect that is because I have been using it wide open, rather than shut down – others report it having issues at f12 and above. For my own tests, I used a full-spectrum GX1 with 850nm (Wratten 87C, B+W 093, Schott RG850) and 790nm (Wratten 87, Lee 87) long-pass filters, taking multiple exposures at all apertures of blue sky (> 90° from the sun’s direction) framed by light colored clouds or leaves. Loss of contrast and hotspots show very strongly in these conditions at wavelenghs above 800nm. This entry was posted in Howto and tagged hotspot, infrared, lenses, photography on October 30, 2014 by nigelbeighton. Out in the woods today. Full-spectrum modified Panasonic G2, with 660nm lens filter. This entry was posted in Images and tagged infrared, infrared 660nm, landscape, photography on October 30, 2014 by nigelbeighton. A comparison of four different Schott glass types (used in bandpass filters), which combine UV and IR, and exclude Visible. The UG11 looks very similar to the UG1 I already have (results blow); however, the UG5 and BG3 look to allow in greater levels of UV and a small amount of visible – potentially more blue and some green coming in. I just need to find a source for these types of filters as they are hard to get hold of. This entry was posted in Howto and tagged filters, howto, infrared, photography, schott, uv on October 29, 2014 by nigelbeighton. Nice ! Schott make data available for their filters, including the frequency graphs which are helpful in giving an indication of how colour will be influenced. Time to see how a BG3 compares to a UG1. Just wish I could find a good local source for made filters with the glass. Managed to get some time this afternoon to play with the UV+IR pass filter – approx UV up to 400nm and IR from 700nm; cutting visible light from 400 o 700nm out. Really like how it gives blue skies (with a little hue sliding form violet) and white foliage, without having to unsubtle colour swap and change all the image to a shade of blue. Allows the blacks and greys to be that and not a shade of blue. Like it. Full-spectrum Panasonic G2 with a Schott UG1 filter. This entry was posted in Images and tagged infrared, uv on October 28, 2014 by nigelbeighton. The first thing that stands out to me is how easy it is the take the UG1 image, UV+IR only (cutting out 400-700nm), and slide the violet of the sky into a nice blue, but still keep the white of the building and foliage). I this was a straight 720nm image, colour sapping the R<>B would have also tinted the building blue. Using UV and IR negates the need for colour swapping, which is a rather blunt instrument, and helps on the likes of buildings and general non sky or foliage.